What are we to make of artistic self-portraits in the age of the selfie? The once rare self-portrait has become commonplace. Is there any special significance left in making self-portraits? This exhibition explores these questions and others through painting, sculpture, installation and photography. Pinned away from the wall, black strips of decayed material are loosely knitted together, forming a long narrow tapestry with gaping holes. Worn out, the fabric hangs by mere threads and tiny bits of material form a small pile in a dustpan on the floor. Originally, this was a favorite sweater of mine, one I wore beyond its useful life. I remember buying the pullover in an upscale boutique but later upon looking at the tag, I discovered it was actually from J. Jill. Slightly surprised that I had conflated multiple experiences, I realize that my memory, like this material, is also subject to erosion over time. Multiple capped pipes stick out of a wall of the City College of San Francisco Art Gallery. Painted in a effort to blend into the white walls, these pipes no longer serve their original purpose and speak of rejection, restriction and unrealized potential. How might I honor these aborted conduits by means of material extension and offer them support and encouragement to dream? Reverie is inspired by the joy I had of experiencing conduits sounding like wind chimes. From further away the gold color elevates the pipes and is a metaphor for success. At a closer distance, the shoddy paint job is a reminder that success isn’t always what it’s cracked up to be. The pillows hold the offering of a stick to hit the pipes against each other to experience life’s simple joys in this moment. 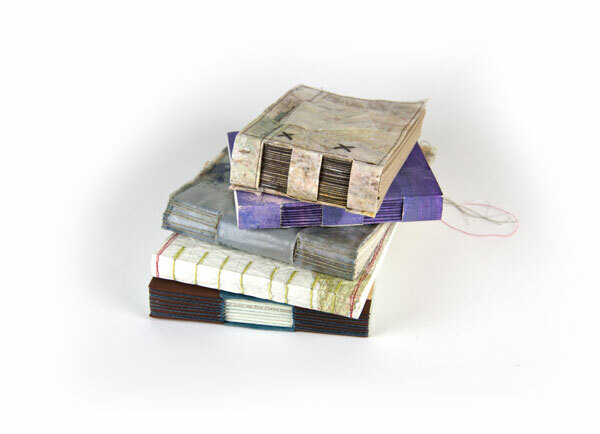 I’m looking to another wonderful summer teaching a week long book arts class at Feather River Art Camp: June 9–16, 2019. Come join me! Spend a fantastic week creating a variety of book structures. Start with the basics like the simple accordion and the pamphlet stitch. Get inspired by the natural environment, consider the metaphors of the book or collaborate with other campers to create something meaningful for you. In addition, make a variety of soft and hard cover books with exposed spines including sewing around tapes, long-stitch and a modified Retchōsō binding. These books open flat and have multiple sections making them great for notebooks and sketchbooks. You’ll have an opportunity to experiment with different materials to make covers: Momigami (kneaded paper that feels like cloth) and fused plastic. These techniques can be used to make alternative things in addition to covers. Additional materials will be available to make multiple versions of the same book to reinforce the techniques. Previous bookbinding experience is helpful, but not required. Please bring the following materials: bonefolder, bookbinding awl available at: The Caning Shop, self-healing cutting mat, ruler and triangle or ruled square, i.e. Omnigrid, craft knife, i.e. : X-Acto knife with no. 11 blades, scissors, favorite mark-making tools: a pen and/or pencil. $30 materials fee will include a variety of papers, paints, Konnyaku and other supplies. For several years now I’ve had the privilege and joy of teaching at Feather River Art Camp in Quincy, CA. Click the link to to find out more about my class Upcycling the Everyday Garment. (From left to right) Featuring the work of Shannon Abac, Kimberley A. Arteche, Nash Bellows and myself. Click on the image to view the brochure. If you can’t make it April 16 and want to come another day, let me know and I may be able to give you a private tour. Regular gallery hours: Wednesday through Saturday, 11am–4pm. SF State is accessible by BART and Muni. Transit info here. Feather River Art Camp is an amazing place……and the OPPORTUNITY to do what you love for a solid week without interruption. So many classes to enjoy…from painting…to clay…to playing the harp. I’m looking forward to my third year teaching in this magical environment. I will teach a variety of book structures including folded books from a single sheet of paper and soft cover notebooks and sketchbooks. Some favorites pictured above are the Buttonhole, the Crossed Structure and a modified Secret Belgian binding. Covers will include Momigami (kneaded paper that feels like cloth), fused plastic and painted paper. It’ll be fun! More here. I’ll be posting on Instagram for awhile now. Follow me: @leahvirsik. I am posting daily drawings of my art. Thanks to Amanda Hawkins’ mention of The 100 Day Project, I am hooked. I have this sense that if I keep working something good will come out of it. Emma Chiang created three inspiring audio slideshows: Healing Art Series featuring me and two other San Francisco State grads. This project of cutting up denim jeans and sewing them together is eventually going to become unwieldy. I’m trying to figure out how to make that more manageable. I realize in this project I like to have some specific parameters but not too specific an idea of what it’s going to look like at the end. I’m open to possibilities of being something else that I originally imagine. But why work the whole thing at one time? Why not create a bunch of units the same size and then assemble them? Perhaps that be would that be too orderly? I am interested in having people move their position when viewing an object. Or at least I am interested in taking different positions when I look at objects, i.e. : lying on the floor and looking upward. That means I need to create something for the floor and the ceiling. I always appreciated going to the dentist, etc. and looking at images or mobiles up above. I love the ceiling at Johansson Projects.